Is your company planning to reorganize its hierarchy structure? Today, organizations have to face changes more frequently and often without much time to prepare. 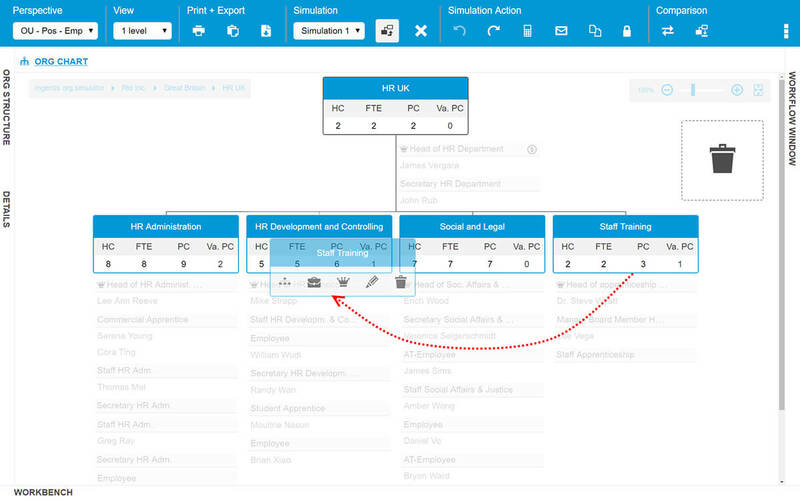 Be it the reorganization of existing employees, positions or org units, or a business extension based on a merger or acquisition – the org.simulator module helps you prepare structural changes and model new hierarchies directly in your org chart. Simulate multiple plan versions and scenarios of your organization’s structure with the org.simulator module. These org modeling simulations can be performed in a user-friendly manner and include the reorganization of objects via drag & drop as well as their creation and removal. Of course, existing information can be also modified. Simulations can be created directly in the browser – independent of platforms and without installation efforts. 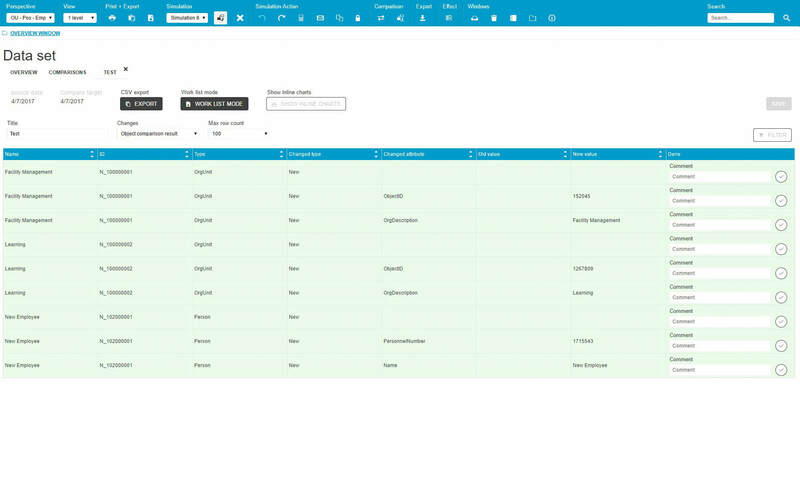 Rest assured that the core data in your HR system is not affected by the simulation using org.manager on-premises. Nonetheless, the theoretical changes can be applied using the results of a comparison data set. Do you want to copy your simulated reorgs with org.manager on-premises into SAP HCM? All changes made in org.manager [web] for SF can easily be transferred to the HR system SAP SuccessFactors™ in a manual or semi-automated way and can be viewed in a report. HR related data such as occupation ratios, scope of management, and staff costs are important variables in human resources and management. When simulating a structural reorg, it is important to keep track of the key performance indicators and how they are affected by structural change. Thanks to the org.simulator, KPI’s are updated post-reorganization at the push of a button. org.simulator makes it easy to compare several structures with one another, e.g. the current state with a newly simulated one. The differences are highlighted graphically and thus can easily be tracked and understood. In order to write back these changes to the HR system, the software generates data sets which list the differences between the various structures based on their effective date. It’s possible to provide co-workers with their own access to org.simulator in order for them to retrieve existing simulations or create their own. In addition, scenarios can be shared with colleagues and executives to work together on the same simulation. 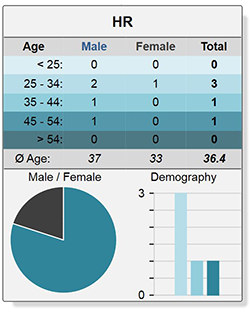 Playing out multiple scenarios with the org.simulator by moving around positions or employees facilitates your workforce planning process by allowing you to find the perfect employee for a project at the right time. With the associated KPIs adapting to change, the allocation of resources can be analyzed and visualized prior to implementation. The org.simulator also supports succession planning. You’ve performed a simulation in Ingentis org.manager and now you’d like to transfer these changes to your SAP HCM system? Winshuttle offers the possibility to copy data from Ingentis org.manager to SAP’s HR system. All necessary transactions are recorded via the Winshuttle Studio and transferred to an excel sheet template. Finally, this sheet is loaded into SAP HCM together with lists showing the differences between the status quo and the simulation.